A series of photographs taken over 10 years has revealed the dramatic changes to one of New Zealand's most famous glaciers. The Massey University scientists who took the pictures - at the same time each year during surveys - say the changes to Fox Glacier on the South Island's West Coast are also having a major impact on the surrounding landscape, with the valley rising by more than a metre in the last two years. 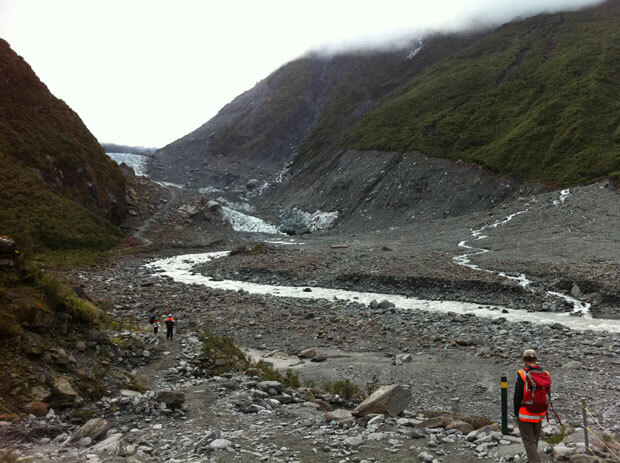 Scroll down to see the changes Dr Sam McColl and Associate Professor Ian Fuller visited the glacier last week to continue their annual survey of the valley floor, a project which aims to understand how glacier retreat affects landforms and sediments in the Fox Valley. 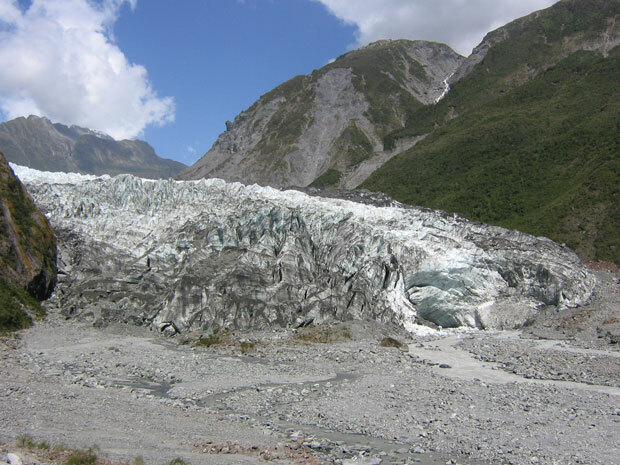 Dr McColl said changes in glacier behaviour, such as calving and glacial retreat, had impacts that extended beyond tourism to affecting the sediment in the glacial valley. "With this kind of change, we could see the whole valley looking drastically different in a hundred years' time." The West Coast glaciers were extraordinarily sensitive to changes in precipitation, temperature, and human interference, and responded rapidly to changes to those climatic parameters. 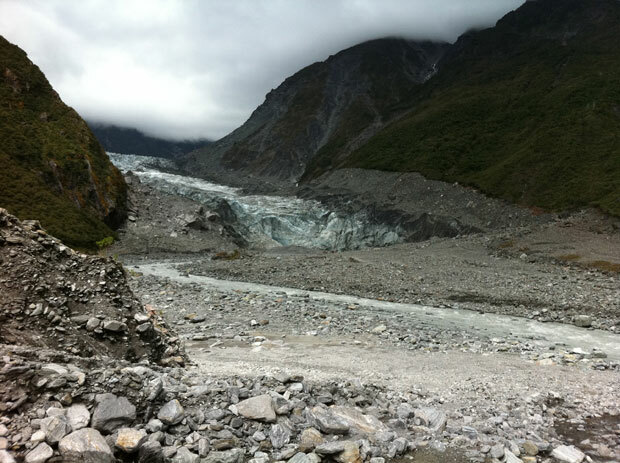 "Changes to the glacier ultimately mean changes to the surrounding sediment and landscape," Dr McColl said. "Dramatic phases of retreat, like the one the glaciers are experiencing now, remove the buttress effect provided by the glacier - essentially a door-stop that makes the surrounding hill slopes more stable." Without it, he said, the hill slopes became more unstable and likely to fail, which led to more sediment being delivered down-valley. 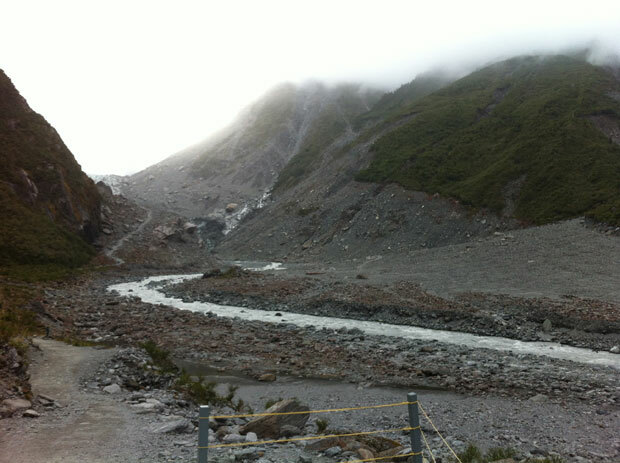 At Fox Glacier, this extra sediment was what had resulted in the valley floor rapidly increasing in elevation. 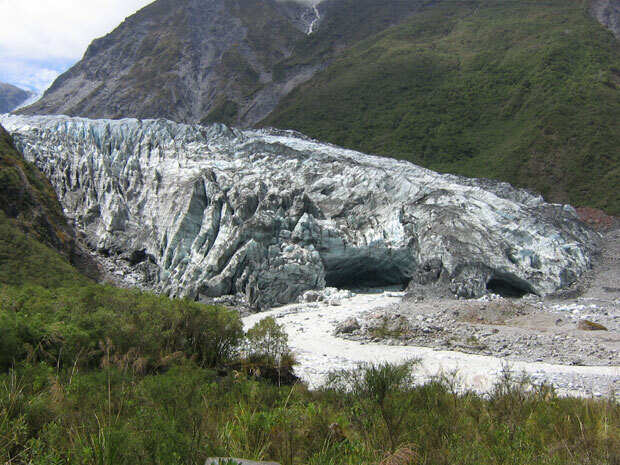 Earlier this year, the Department of Conservation announced that the Franz Josef and Fox glaciers may be accessed only by air. 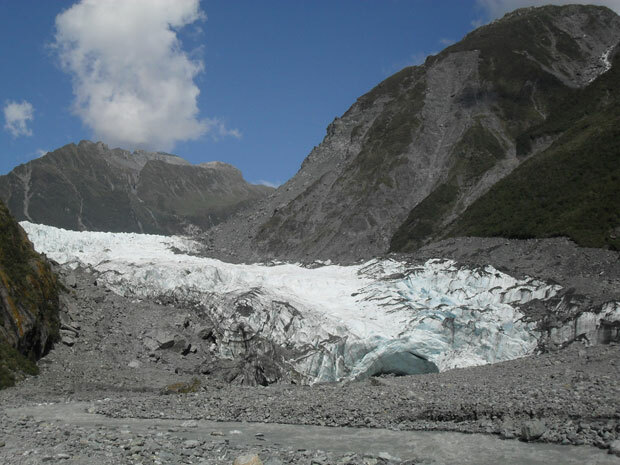 The gradual loss of "permanent" ice in the South Island's alps and glaciers has led to growing concern over recent years (story continues after the photos). Photos supplied by Associate Professor Ian Fuller An analysis of aerial surveys, published on Australian website The Conversation last year, showed a third of the permanent snow and ice on the Southern Alps had vanished in less than four decades. Partly using aerial surveys by the National Institute of Water and Atmospheric Research, study authors Dr Jim Salinger, Professor Emeritus Blair Fitzharris and Dr Trevor Chinn calculated the alps' ice volume had shrunk by 18.4cu km or 34 per cent - and those ice losses have been accelerating rapidly in the past 15 years. When compared with rapid glacier retreats in many parts of the world, the loss raised serious questions about future sea level rise and coastal climate impacts, they said. 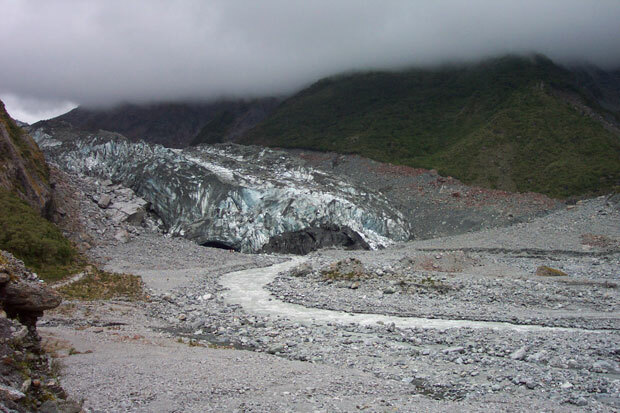 Niwa results were used to calculate the annual glacier mass balance, and to quantify the volume changes of small to medium glaciers in the alps. Glaciers generally responded quickly to annual variability of weather and climate, although the response was more subdued for the 12 largest glaciers, among them the Tasman and Godley, which had a thick layer of insulating rocks on top of the ice lower down the trunk. The World Glacier Monitoring Service estimated extent of ice volume in the Southern Alps in the 1890s was 170cu km, compared with over 36.1cu km now - a change the authors said was evidence of the local effects of global warming. Based on regional warming projections of 1.5C to 2.5C, it has been projected by glaciologists Valentina Radic and Regine Hock that just 7 to 12cu km of ice would remain on the alps by the end of this century Another study, published last year in the US journal Proceedings of the National Academy of Sciences, suggested that ancient New Zealand glaciers were out of tune with their Northern Hemisphere counterparts when they grew and subsided thousands of years ago. This went against an alternative view that our glaciers followed the same patterns as those in the opposite hemisphere between 30,000 and 20,000 years ago, when ice sheets were at their most recent maximum extension. 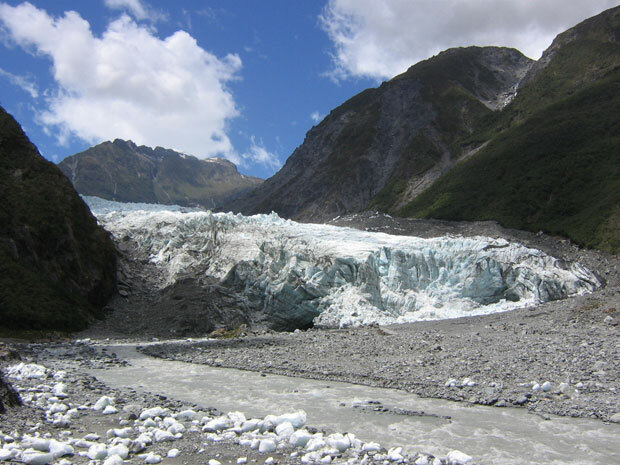 The study, led by the University of Greifswald in Germany, analysed a record of glacier debris in the Southern Alps' Rangitata Valley from between 28,000 and 16,000 years ago. 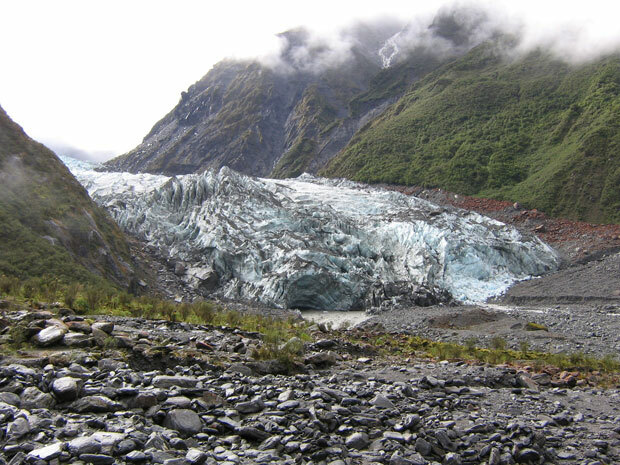 According to the study, the records of glacier movement, preserved in "exceptional detail", showed New Zealand glaciers peaked earlier and retreated more slowly than Northern Hemisphere glaciers, and were only partially influenced by northern climate patterns. At the time it was published, Victoria University researcher Associate Professor Andrew Mackintosh said though the new findings were compelling, whether our glaciers followed their northern counterparts remained an open question.